Linoleum flooring offers a full spectrum of color options. Like sheet vinyl, it rolls out on sheet goods instead of tiles. The material is resilient and can restore its shape, despite shifting from installation and foot traffic. It’s easy to clean, but requires a little more attention than vinyl. Linoleum is sensitive to cleaners and floor strippers that are high in pH. We can recommend the best way to care for your linoleum floor should you choose this great option. Linoleum flooring is a great eco-friendly option because it’s mostly composed of natural raw materials. These materials offer a unique scent that will bring back sweet memories of schools and kitchens of your youth. 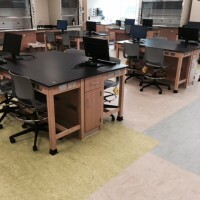 The featured images showcase a major project Greenfield Flooring completed at Roberts Wesleyan College: flooring for their new math / science building. The products we installed included linoleum sheet goods and tile. You can see the materials that are heat welded together at the color intersections. 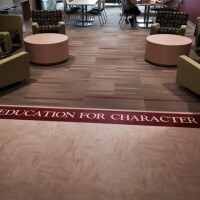 Greenfield Flooring also performed custom water jet logos with linoleum installed on two floors of this newer building. 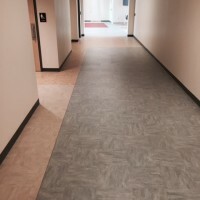 Ask us if linoleum flooring would be a good choice for your facility. We’d love to offer you some samples to help you imagine the completion of your project.